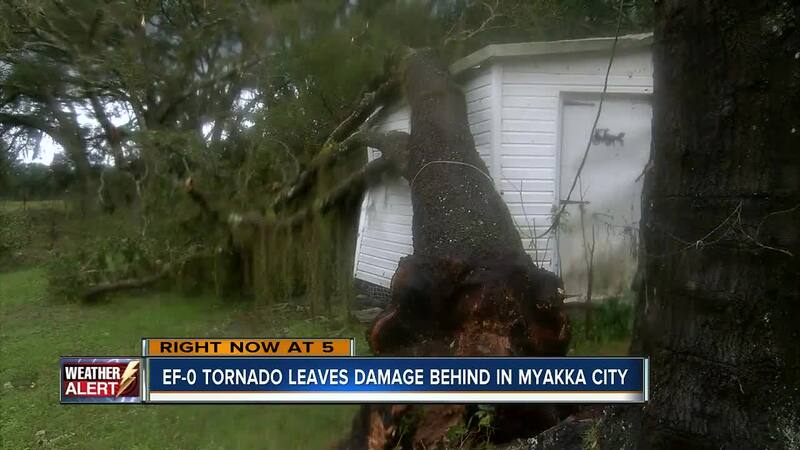 An EF-0 tornado touched down Thursday morning in Myakka City, causing heavy damage for some homeowners. 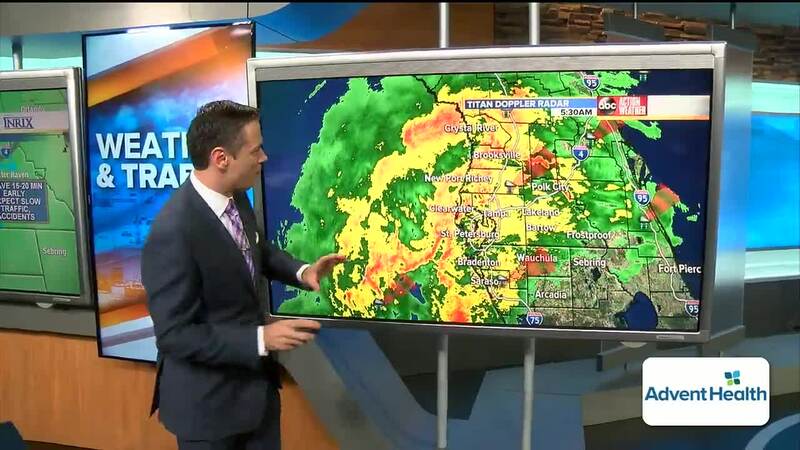 TAMPA, Fla. — Three tornadoes touched down on Thursday afternoon in Tampa Bay, the National Weather Service confirmed. The tornadoes touched down in Myakka City, Lake Wales and Fort Meade. All three tornadoes were EF-0 tornadoes. At approximately 9:15 a.m. an emergency manager in Cooked Lake Park, south of Lake Wales, reported a possible tornado that caused roof damage to a home on Genesis Pointe Drive. One person was reportedly injured and taken to the hospital. 9:07 a.m. Pasco County Fire Rescue is responding to a possible tornado touchdown on Forest Lake Drive in Zephyrhills. Officials say 80 homes in the Forest Lakes Estates Mobile home community have various damage. No injuries have been reported at this time. Four home have been deemed unsafe. At approximately 7:40 a.m. an emergency manager in Myakka City reported a tornado touchdown along Kibler Ranch Road and says a porch was blown off of a house and there are multiple trees down, according to the National Weather Service. Coastal flooding is possible today due to strong on-shore winds. In-land flooding is also a threat due to very heavy rainfall. Some areas could see more than 4 inches of rain this afternoon. FHP says the Sunshine Skyway Bridge is open but is telling motorists to use caution and keep headlights on. If you're traveling today, besure to check your flight status with TPA . Three sandbag locations will open to help homeowners with flood-prone property. Sandbags will be available today only from noon to 6 p.m. at Anderson Snow Park located at 1360 Anderson Snow Road in Spring Hill. Sandbags are self-service, bring your own shovel. The Metropolitan Ministries holiday tent in downtown Tampa and on its Pasco campus in Holiday has closed for the day on Thursday, December 20. Busch Gardens Tampa Bay is closed. Gates to Raymond James Stadium open at 6:30 p.m. and the game kicks off at 8 p.m.
All after-school activities have been canceled for Thursday, December 20th, except extended day and aftercare programs. All athletic games are canceled. Pier 60 is closed 12/20. Polk County Schools says all outdoor afternoon activities have been canceled due to severe weather. After school activities canceled, except for after-care child care. The parade has been canceled for safey reasons. The city has canceled Mayor Bob Buckhorn's Holiday Food Basket Delivery due to weather.